Facebook is saving the day for users who have an interest in keeping up with content, but don’t have time to read it right away. The social media network has introduced a Save feature that lets users store links from their Feeds, friends, and other Facebook pages on a special list and then read them at another time. With Save, users can read all of the content they want, at any time they want, without needing to stop and drop whatever they’re doing to read a story before it’s gone. While extending the length of time for reading, Save also extends the life of content to add long-term value to content marketing. To see how Save lets the latest content be read at a later date, TechCrunch.com stockpiled the details. Facebook first tested a version of Save in March 2012, shortly before acquiring a similar startup called Spool. After much tweaking and testing, Facebook is rolling out this feature for iOS, Android, and Web over the next week. Save will provide Facebook with a direct competitor to third-party read-it-later services like Pocket and Instapaper. More importantly, Save will provide Facebook users with a fast and easy way to set aside the latest links and content to be read at another time. 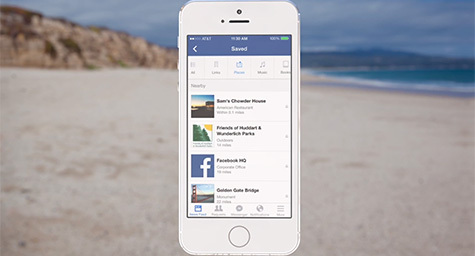 Now, there’s no need to interrupt News Feed reading flows or worry about skipping a story. Save offers the convenience to browse in brief bursts and then read links when time allows, as well as the flexibility to read reserved content while on the go, via mobile feeds. This means that Save could increase cross-platform usage, mobile feed reading, and the quality of the News Feed itself by indicating the highest caliber content. The feature could also enhance the user experience by making shorter scanning sessions less stressful because there’s no need to worry about having no time to read the content since any story can be saved and savored later. Facebook made the feature extremely easy to use. To save stories in the mobile and Web News Feed, users can tap the Save icon included at the bottom right of the story or they can select the Save option on the drop-down menu located on the top right of the story. Stories in Facebook Pages for Places, Movies, Events, TV shows, and musicians can be saved by clicking the prominent Save button located next to the Like or RSVP options. Saved content can be accessed by either clicking on the Save link in the Web homepage’s left sidebar list of bookmarks, or on the More apps list on mobile. It’s important to note that all saved content is only visible to the individual user. Of course, any content on a user’s Save list can be shared or archived. And users will need Web connectivity to view any Saved links because Facebook is not currently caching them. To help users keep track of all of the stories they Save, Facebook will occasionally send friendly reminders to the user’s News Feed featuring carousels of the content they’ve Saved. It looks like Facebook’s new Save feature has come just in time to give users a more valuable social media experience and provide content marketers with more value for their digital dollar. Learn how content marketing can keep your customers coming back for more. Contact MDG Advertising today at 561-338-7797 or visit mdgadvertising.com.